Astigmatism: Astigmatism is usually caused by an irregulary shaped cornea. One meridian is more curved than the meridian perpendicular to it. Dry Eyes: Dry eye symptoms can include: irritation, burning, redness and blurred vision. 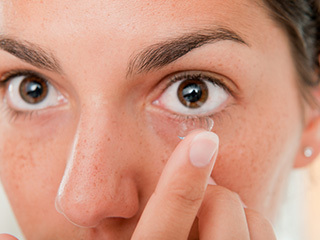 Contact lenses can exacerbate dry eyes by interfering with the tear film. Keratoconus: Keratoconus is a progressive, degenerative corneal condition. The cornea thins and bulges into a cone-like shape. Patient with keratoconus need to wear special contacts lenses to see properly(glasses and soft contact lenses do not work). Presbyopia: Presbyopia is the gradual loss of the eye's ability to focus on near objects. It usually starts in early 40s, where people find their arms aren't long enough. Toric lenses are useful for correcting astigmatism. The contact lenses have variable powers that take into account the astigmatism correction. The fit of these lenses is more complex since they need to sit in the correct orientation. Toric contact lenses are available in daily disposable and re-usable(monthly, bi-weekly). Multifocal lenses can help remedy presbyopia. Monovision lenses are another option for presbyopia. This involves correcting one eye for distance vision and the other for near. Multifocal and monovision contact lenses are available in daily disposable and re-usable(monthly and bi-weekly). Dry eyes are managed with a variety of treatment options. This includes: hot compresses, lid hygiene, omega 3 supplements, artifical tears, prescription medications, and punctal plugs. Also, special contacts lenses called scleral lenses can be used to treat dry eyes. These lenses keep tears in contact with the cornea to keep it hydrated and comfortable. Patients with keratoconus, whether untreated, post corneal cross-linking, or post corneal transplant usually require special contact lenses in order to see properly. The most effective contacts lens in their situations is the scleral contact lens. There lenses vault over the irregular cornea and provide a regular refractive surface and allow for clear vision.